relax : massage is a wave, let yourself be cradled! Californian massage: full body. It brings a deep relaxation, touches the heart and links body to mind. Swedish massage: Both invigorating and relaxing. It dissolves muscle tensions and restores natural balance. Cashmiry, Chinese Tao and Indian Tantra: focused on sensory development. It is at once energizing, meditative and sensual. They promote mental and physical harmony through the liberation of energy. Janzu water meditation: a powerfully relaxing and revealing experience from Mexico's lagoons. You are cradled, physical and psychological tensions are quickly lifted by the combined movements of the water and masseur. A free and intimate dance with water. As trust develops, breathing slows considerably and you find yourself letting go of psychological blockages. Energy centers around your body retrieve their balance allowing youto get back in touch with your true self. A deep meditation. Foot reflexology: this manual practice restores body balance and starts up self healing natural process by sustained pressure with fingertips on feet's reflex zones related to particular organic fonctions. Yoga: this Indian philosophiy blends physical exercises and meditation to increase self awareness. Why notry suspended yoga! 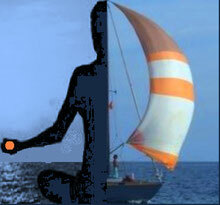 A long strip of fabric like a cocoon attached to the mast of the boat mast or a palm tree, supports you in your pose. And, of course, the caribbean way of life: this a place where different cultures have coexisted for centturies, each of them with their own wisdom, resulting in a community that is skilled in the art of living well together. Continents in their endless conficts can be relational deserts whereas islands, oases in the world's biggest desert, the ocean, are concentrated spots of pacifism where you can meet calmly with yourself and others. Massages are provided on board, in the water or on land, in a natural setting or at home, individually or in groups. Relaxocean welcomes practioners to share, develop, communicate and transmit their art of massage.